This instrument made by George Sterrop (17151756) is a Cuff-style compound microscope on square mahogany base with one accessory drawer. It is remarkably similar to the Cuff instrument in the Golub Collection. The single-sided mirror is mounted on a gimbal, which is pinned into the brass mounting plate so it may be rotated. The microscope body and sample stage are supported by a rectangular brass pillar, which is paralleled by another, movable rectangular pillar for focusing. Fine focus adjustment is by Hevelius screw. The body tube has the same shape as the Cuff instrument, with a threaded, tapered end for removable objective lenses, and a single-lens eyepiece at the top. There is an internal field lens. The microscope body slides into a hole in, and is supported on, a horizontal arm ("cross arm"). This support arm is screwed into the top of the movable, focusing pillar. The stage has the three-armed configuration of the Cuff design. Two arms have slots for accessories. In the center of the stage is a hole that accommodates a Bonanni spring stage for flat, mounted specimens. 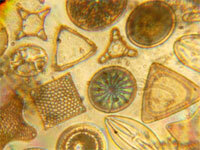 When viewing opaque samples using the included lieberkuhn reflector the spring stage would have been removed. Around the periphery of the center hole is engraved "Sterrop London fecit." Accessories are 4 additional objective lenses (five total), Bonanni spring stage, tube sleeve with lieberkuhn, and two sample slides. The height of this instrument is 38.5cm, with a base that is 16.5x16x5.5cm. George Sterrop was trained in the instrument workshop owned by his mother, Mary Sterrop. He apprenticed to his mother in the Spectaclemakers' Company in 1730, and joined the firm as a partner in 1737 until 1747, when it was known as "Mary Sterrop & Son." He continued the instrument making business from 1747 until 1756. 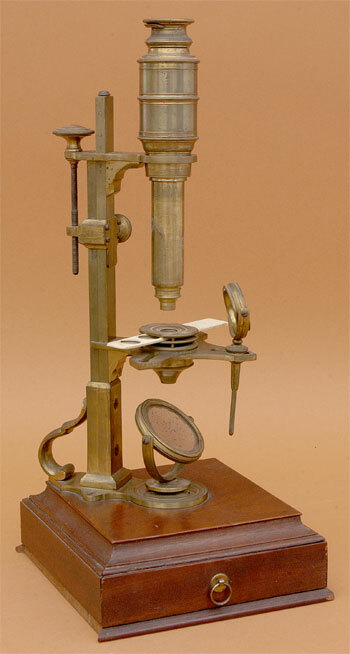 George Sterrop made a number of microscope models, including a Culpeper-style instrument. Peter Dollond, son of John Dollond (inventor of the achromatic doublet), took over the Sterrop firm in 1767. Sterrop was thought to have been the inventor of the "Cuff-Type" of microscope due to an error in a book on microscopy written in 1747 by Joachim F. Mayen*. Cuff-style Sterrop microscopes are found in the Utrecht University Museum and in the Billings Collection (AFIP 518909). *JF Mayen: "We have to thank the skill of an admirable English artisan of the name of George Sterrop for this." IN Kurzer Unterricht von der Vergrosserunsglasser und Teleskopien. 1747.